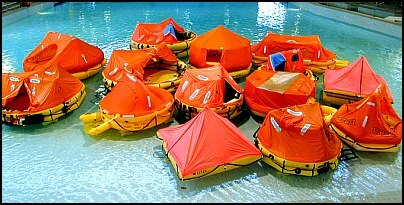 For our comprehensive year 2000 test, we asked for both 4-person rafts, typical of light GA (General Aviation) use, and 10- to 13-person life rafts. Many of the larger corporate jets use these bigger rafts and there are enough detail and performance differences that we wanted to look at both common sizes. Except for rafts aimed solely at the light GA market, we requested all rafts be equipped to FAR Part 135 specification. * Raft acquired for test without cooperation of manufacturer. With but a single exception, all invited manufacturers eagerly supplied rafts for the first evaluation. Survival Products declined to do so citing their unwillingness to have their rafts tested without a representative of the company present. We were, however, able to obtain an Survival Products raft from a cooperative corporate aircraft survival and life raft specialist, Neil Looy at Corporate Air Parts in Van Nuys, California. For the second evaluation EAM declined to participate, citing the results (an unacceptable rating) of the first evaluation. Hoover claimed they had nothing new to show and declined to participate and Survival Products again declined. We managed to obtain samples of EAM and Survival Products rafts from alternative sources. In a follow-up phone conversation with Survival Products Vice President Donna Rogers, they had an apparent change of heart with Rogers telling us that in light of the letter they had reconsidered and wanted to participate. But then, in the same breath, Rogers told us that, "unfortunately," the demand for their new TSO'd rafts was so great and their backlog so long, that they couldn't possibly spare any rafts to send us until well after our deadline, their customers must come first. Yet, the next day and later that same week associates were able to call up, speak to Rogers, and order these same impossible-to-obtain rafts for nearly immediate delivery (without asking for any special handling), one in a week, the other within two, over a month before our deadline. Biting the bullet, we purchased the rafts through these proxies without SPI's knowledge. The rafts we purchased were subsequently serviced and then sold, at a discount, with the new owners fully aware of the circumstances. Some old-timers may notice two formerly prominent names missing from our list. Both Switlik and Elliot dropped their aviation raft business nearly a decade ago. Switlik still produces aviation rafts for the government and selected commercial customers, but not for sale to the public. The Elliot rafts were pretty much clones of the old style BFG rafts and most comments in review of that raft apply. The initial evaluation was conducted at a fitness club in Tucson, Arizona in their heated (84 degrees Fahrenheit) indoor pool. Optimum conditions, for sure. We considered doing it on the open water, but we couldn't find any volunteers that crazy. That would have also made some of our evaluations more difficult and as it turns out, some data points would have been lost. All the volunteers wore normal street clothing and athletic shoes and also donned standard aviation double cell life preservers during the tests to help simulate the difficulties associated with maneuvering into and about the rafts while wearing them. They finished the day exhausted, bruised and beat, testimony to the physical toll simply getting into and setting up some of the rafts took on them. For the second test, we tested the rafts in a wave pool (at Kiwanis Park Recreation Center in Tempe, Arizona) which made for a much more realistic test of the rafts' capabilities, but also left our volunteers even more beat up, bruised and exhausted than last time. A number of volunteers even became seasick. Water temperature was 84 degrees (Fahrenheit), air temperature varied, but averaged about 80 degrees with approximately 80% humidity. All the testers, except for two of my experienced evaluators, wore normal street clothing and athletic shoes and donned standard aviation double cell life preservers during the tests (courtesy of Hoover Industries). The year 2000 tests were once again conducted in Kiwanis Park Recreation Center's wave pool. The volunteers, who quickly nicknamed themselves "Raft Rats," spent three very long and exhausting days testing 34 life rafts. The aviation rafts were all tested as a group. In addition to the righting, boarding, stability and general performance tests, this year the Tempe Fire Department provided a hydrant and 300 ft. of hose to test the effectiveness of the life raft's canopies in protecting survivors in extreme weather conditions. Roadrunner Fire and Safety of Glendale kindly lent us fittings and an adjustable nozzle for the fire hose. The screams of volunteers emanating from inside the life rafts provided quick testimony to any deficiencies that let in the cold water. Using the wave pool ensures consistency and enables accurate comparisons and measurements. With the wave machine cranked up to give its most aggressive waves, one Raft Rat with extensive sailing experience noted, "the waves are a whole lot more realistic than I expected, it really is like being in the ocean." While taking a flotilla of boats and the life rafts out into open water might possibly have been more "fun," experience has shown that it is extraordinarily difficult to cope with the logistics involved under such conditions and difficult as well to draw useful comparisons because of the inherent variability of the natural environment. And, the logistics of dealing with 34 life rafts, even in a controlled environment on solid land, taxed everyone. Prior experience has also shown that testing only in calm waters in a pool, off a pier, or on a bay can mask deficiencies that show up under rougher conditions. Subsequent open ocean testing of many of the same life rafts previously tested in the wave pool have proved the results are accurate and scalable. Our testing is dependent upon good record keeping which was facilitated by use of J. L. Darling Corporation's "Rite in the Rain" waterproof paper. All our data forms and such were produced by photocoping on their waterproof copier paper, which proved a real boon in the wet environment where splashes and such were impossible to avoid. We also tagged all the equipment with their waterproof tags, helping to ensure that we could easily track it without confusion, even as we tested it in the water. Their support is appreciated. After completion of the the wave pool tests, the rafts were moved to a warehouse where we meticulously detailed each life raft, measuring, taking gigabytes of digital photos and making notes of design features and equipment--both good and bad. Sea anchor/drogue effectiveness, manual inflation pump tests and other equipment tests were also conducted. Each Survival Equipment Pack (SEP) was opened and the contents analyzed and photographed, and where appropriate, tested. By the time all was completed, we had 200 pages of information and brochures from the manufacturers, nearly 300 written evaluations by the volunteers, nearly 500 pages of added notes from the warehouse evaluations, approximately 3,000 digital images, a dozen roll of print photos, plus almost 12 hours of digital framed video from the in-water tests. Can you say information overload? NOTE: Through a combination of circumstances, mostly having to do with limited finances, we shot very few stills of the raft tests at the wave pool. At the last minute a number of volunteer photographers, including a planned underwater videographer, had to cancel. As a result, most of the photos of the rafts in the pool have been captured from the digital video we shot. They range from poor to good, but most are just fair. And, even with two digital video cameras there were times when we just didn't get a nice shot due to camera placement and other factors. However, while not necessarily pretty, all the important stuff is here. Just so you know why the images aren't up to our usual standards. As potential problems became evident with many rafts, even in our benign test venues, we had to wonder how a downed pilot and passengers, probably in shock, possibly injured, could manage in any sort of sea state, cold water or wind condition. This became an overriding concern.